Lord Byron was born as George Gordon on January 22, 1788 in London, England. As the son of Captain John "Mad Jack" Byron and his second wife, Lady Catherine Gordon, heiress of Gight, Aberdeenshire, he suffered a deformation of his feet, known as club foot. Gordon was christened as George Gordon after his grandfather, a descendant of James I. When his grandfather committed suicide in 1779, Gordon's mother, Catherine sold her land and title to pay for her father's debts. John Byron later married Gordon's mother Catherine for her money, however soon he squandered it and deserted her. This and Catherine's father's suicide led to little guidance for her son George. This led to a spirit of revolt and lifelong consequences. The two separated before George's birth. After, the two moved to Scotland and lived on what was left of her fortune. But on May 21, 1798, at age ten, George's uncle had died leaving him as the sixth Baron Byron. Lord Byron received his education at the Grammar School in Aberdeen until 1801, when he was sent to Harrow and remained there until 1805. After, he proceeded to Trinity College, Cambridge and became fascinated with history, fiction and extravagant life. In 1806, Byron's first verses were published and in 1807 published Hours of Idleness, which was greatly criticized. However, in reply to such criticism, Byron published English Bards and Scotch Reviewers in 1809 and went through five editions. In the meantime, Byron left to Newstead Abbey, the family seat until 1809. He then left England and traveled through Spain and Greece until his return in 1812. 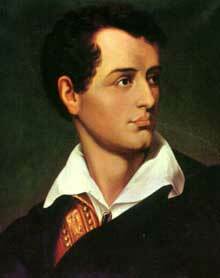 During this time Byron wrote Childe Harold and published it on his return only to receive great reviews. He followed up Childe Harold with more amazing short poems; The Corsair, Lara. Around this time he met and befriended his future biographer, Thomas Moore. On February 27, 1812 Lord Byron took his seat at the House of Lords and made his first speech there. Byron then became the most popular person in Regency London, writing poetry and carrying on illicit affairs, most notably with Lady Caroline, wife of future Prime Minister, William Lamb. Lady Caroline also inspired the epigram "Caro Lamb, Goddamn." There are also rumors of Byron's involvement with a choir boy and an incestuous relationship with his half-sister, Augusta Leigh, however many scholars dispute this. To help avoid scandal, Byron chose to marry Anne Isabella Milbanke (Annabella), cousin of Lady Caroline who refused him a year earlier. The two married at Seaham Hall, County Durham on January 2, 1815. As a stipulation in her mother's will, Annabella's beneficiaries must take her family name. Lord Byron then became known as George Gordon Noel Byron in 1822.